Tonight I upgraded to WordPress 2.0.2. I also think I have my antispam tool in place and working now. So this post is open to comments. Your first comment posted will require approval. After that, you should be able to post without approval. I have had comments turned off on the blog (primarily due to concerns about spam). I stumbled across Akismet tonight. They offer a free service that scans blog comments for spam content. So in the very near future, I hope to have that up and running. I will be sure to post when I am ready to hear from you. Life is not about what’s easy. It’s easy to root for the winning team. It’s easy to buy what other people are selling. Ideals such as loyalty and innovation are much harder. It’s in the struggle for those things that are “hard” that we find true happiness. I am a Chicago Cubs fan. People often ask, “How on earth did you ever come to be a Cubs fan?” like it is some sort of disease that nobody wants. But those very same people are the ones who seem envious when they find out I travel to Wrigley Field every year for opening day. Most do not envy the exact experience this game offers. I think what they long for is the consistency and tradition – knowing that each year your have something solid and reliable to look forward to. And for someone who loves baseball … well, there is nothing quite as special as the friendly confines. Come rain or snow – hot or cold – you will find me there. I consider myself truly blessed to have a best friend who shares this experience with me each and every year. Even now that he is married – he (and his wife) manage to make time for this trip. So to Alan and Angela – I love you both. Thank you for being part of my life and allowing me to be part of yours. My loyalty to Cubs baseball makes me happy. Even if they never make it to the world series again, you will always find me in Chicago in early April. After all, this is our year. Go Cubs Go. So this evening I had to reconfigure a PC that I use for video editing. It was currently running Fedora Core 3, and I needed it to run Windows XP again. So I simply plopped in my Windows XP and booted up off the disc. Right about when it said “windows is detecting hardware” it just stopped. The screen went blank and nothing else happened. After many troubleshooting steps, I finally found the answer. Windows would not even install because the hard drive did not contain any valid FAT or NTFS partitions. The only way to solve it was to use a Windows 98 bootdisk and use FDISK to delete the Non-DOS partitions. Once I did that – the XP install ran like a champ. Why on earth would Microsoft design their software to work that way? NASA has announced July 1 to 19, 2006 as the new launch window for Space Shuttle Discovery’s mission (STS-121). This announcement confirms a a delay from the original May launch date in this second return to flight mission. The additional time will allow for the removal and replacement of the four liquid hydrogen sensors in the shuttle’s main fuel tank. Yes folks – it was the moment I was waiting for. 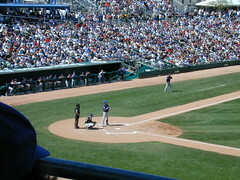 The day on my vacation that I got to watch a Chicago Cubs spring training game. Unfortunately, the Cubs took a serious beating today by the White Sox. I can only hope that the regular season looks better than this. My next opportunity to see the Cubs play will be opening day at Wrigley. As my vacation comes to a close, I find myself relaxed and renewed. It seems like it has been a while since I had a full week off. I almost wish there was a second full week coming just behind this one. But alas, reality must be allowed to slip back in. Plenty of good technology projects coming in the weeks ahead. So how hard could it be to install an external serial modem on a Windows XP box? It certainly required being smarter than the average bear. So we ran down to the local Best Buy store and picked up an external modem. Brought it home (actually read the instructions) and attached it to the computer. Everything was great right up until I installed the drivers. Crash. No blue screen. No warning or errors. Just a reboot. So I tried again – same result. Opted to go into safe mode and install the drivers (which worked). Problem was – as soon as I booted back into regular mode – same crash problem. So it was time for a visit to the Creative support site There I find reference to a problem with newer Pentium 4 machines with hyper-threading. I disabled HT in the BIOS, but the problem did not go away. Long story short folks – it took a modem firmware upgrade and a driver update to get the thing to work. In the end the HT setting didn’t matter. It now works with HT on or off. So take a journey over to the Creative support site if you find yourself in a similar bind. 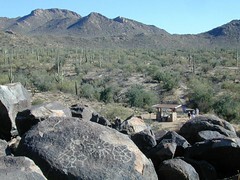 Check out the petroglyph at the front of this photo. Come see more vacation photos on my Flickr account. If you take time to view some of the other photos, you will see pictures taken at the Arizona-Sonora Desert Museum. The birds you see in the pictures are Harris Hawks (part of the museum’s raptor free flight program). Spent about three hours hiking down Sabino Canyon today. Upon arrival, we learned that the Coronado National Forest rangers have observed some aberrant behavior with the moutain lions. The warning was to keep an eye out for the cats – with instructions on how to fight off a mountain lion attack. 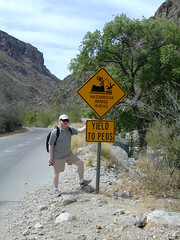 As expected – we saw no signs of mountain lions. I have uploaded additional photos to my Flickr account. 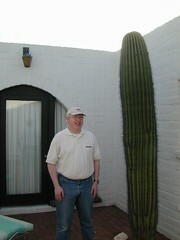 This saguaro cactus, named Louise, was planted by my parents in 1971. At the time it was planted, the cactus was about one foot high. To put the cactus’ growth in perspective, the last time I was photographed next to it (in 1998), Louise was about 3 inches taller than I was. So the growth from the top of my head and above has taken 8 years.